Let’s face it: Mobile game developers better have a solid acquisition and monetization plan in place before they know what the main character’s name is going to be. In fact, acquisition and monetization often drive game design and leveling – and most pre-launch testing is focused on justifying the acquisition budget for launch. 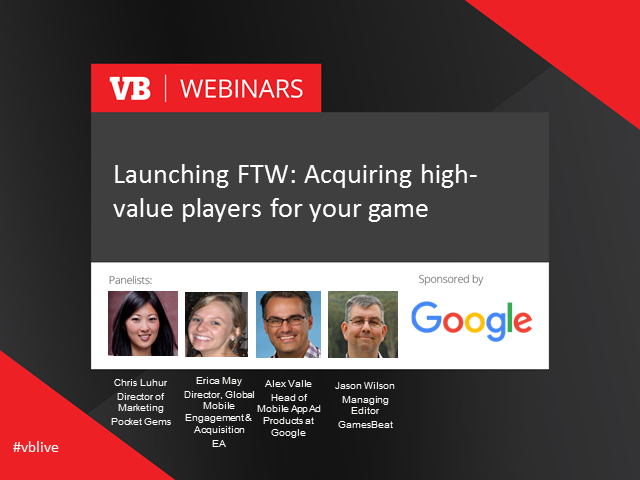 Join us for the first in a three-part series “Games Growth and Monetization” with leaders from the mobile games industry, Google and VentureBeat. In this first session, we dig deep into your plan of attack for a successful launch marketing strategy – from Ready Player One to Mission Accomplished. * Get tips to unlock the intense power of Google’s platform and hear about the latest tools and product updates. Join VentureBeat, Google and other games business experts in the first of a four-part series on "Games Growth and Monetization." Don’t miss out on this live and interactive learning session. Register today.